This document provides supplemental material for the PAM 2010 paper. 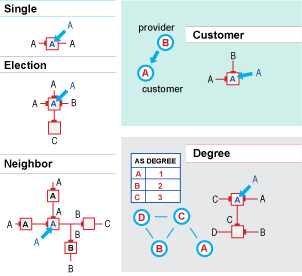 There is growing scientific interest in the structure and dynamics of Internet topology, primarily at the router and Autonomous System (AS) levels. Substantial progress over the last decade toward understanding and improving the integrity and completeness of router and AS-level topologies separately inspired us to seek a graph construction that merges router and AS-level views of the Internet, i.e., a graph in which routers are annotated with the ASes to which they belong, and inter-AS links are annotated with business relationships. Such a view would capture administrative boundaries and relationships between ASes, while providing sufficient detail about the geography and internal structure of each AS. Inherent limitations and inaccuracies of existing techniques for alias resolution, IP-to-AS mapping, and router-to-AS assignment render this goal challenging. In this work we take initial steps toward merging router and AS-level views into a dual graph representation of the Internet. We start from active measurement (traceroute-like) datasets collected using CAIDA's Archipelago distributed measurement infrastructure (Ark). We then apply state-of-the art alias resolution techniques to infer which interfaces belong to the same router, creating a router-level Internet map. Finally, we propose heuristics to assign routers to ASes, using information derived from the interfaces that we infer belong to a particular router. This document describes each of the steps in this process and provides links to the resulting dual-graph dataset. We collected our active measurements using CAIDA's Archipelago (Ark) measurement infrastructure. In October 2009 when we gathered the measurements for the PAM2010 paper, the Ark infrastructure had 37 monitors in 28 countries. These monitors used Paris traceroute to probe randomly chosen destinations from each routed /24 prefix seen in BGP dumps from Routeviews over a 28-day collection period in September and October 2009. We call the resulting set of 268 million traceroute paths our traceroute dataset, which we use to infer which IP interfaces belong to the same router, a process known as alias resolution. For alias resolution, we rely on several CAIDA tools: iffinder, kapar, and MIDAR, (recent tech report). MIDAR (Monotonic ID-based Alias Resolution, a tool we hope to release by April 2010) expands on the IP velocity techniques of RadarGun, while kapar expands the analytical techniques of APAR. We use the traceroute dataset as input to MIDAR and iffinder, which generate output files used as input to kapar. kapar heuristically infers the set of interfaces that belong to the same router, and the set of two or more routers on the same ``IP link'' (a construct that represents either a point-to-point link, or LAN or cloud with multiple attached IP addresses). kapar correctly identified 66% of the true aliases from our ground truth dataset, with a 5% false positive rate. To assign IP addresses to ASes, we used publicly available BGP dumps provided by Routeviews and one of RIPE NCC's collectors (RCC12) in October 2009. BGP (Border Gateway Protocol) is the protocol for exchanging interdomain routing information among ASes in the Internet. A single origin AS typically announces ("originates") each routable prefix via BGP. We perform IP-to-AS mapping by assigning an IP address to the origin AS of the longest matching prefix for that IP address in the BGP tables. In case one of the previously described primary heuristics is unable to produce an AS assignment, we attempt to break the tie using one of the other heuristics as a tiebreaker. Our evaluation in the paper shows that Neighbor was the best stand-alone heuristic, while Election+Degree was the best combination. links.20091006.gz (link dataset) contains, for each link, the set of routers and router interfaces that kapar inferred as sharing that link. indicates that kapar found a link link_id connecting nodes N1 to Nm. Note that kapar always determines at least two nodes and the associated interfaces for each link. There may, however, be additional nodes on the same link due to the presence of LANs or clouds with multiple attached interfaces. By joining the node and link datasets, one can obtain for each node a set of known interfaces and inferred interfaces. Known interfaces were measured directly and are in the node dataset; Inferred interfaces result from entries in the link dataset that indicate that node N1 has a link to interface i2 on node N2, but we did not see an actual interface on node N1. The interfaces on an IP link are typically assigned IP addresses from the same prefix, so we assume that node N1 must have an inferred interface from the same prefix as i2. prefix2as.20091006.gz (IP-to-AS) contains the list of IP prefix to origin AS found in the BGP dumps. When multiple ASes were found as the origin of the same prefix, they are concatenated with an underscore. nodes.as.20091006.gz (AS assignment dataset) contains, for each node found in the node dataset, the AS that is the inferred owner of that node according to to our final Election+Degree assignment heuristic. as-rel.a0.01000.20091020.gz (AS relationship dataset) contains the business relationship associated with each link in the BGP data, computed (see above) using the AS relationships algorithm by Dimitropolous, et al. The RouterToAsAssignment utility is our current implementation of the Degree+Election code.